Call 386-503-5724 Now To Find The Shed For You! Florida weather is sunny most of the time. But, occasionally it can be rainy and you need to think about the outdoor items you value. A portable shed or storage building by EZ Portable Buildings is the perfect solution. 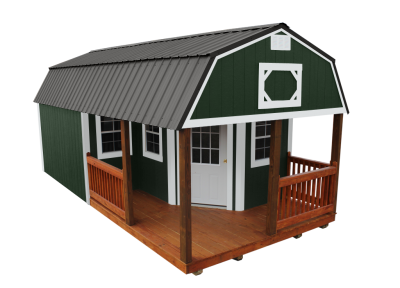 We offer a variety of shed and portable building styles to St. Augustine residents. Putting up a shed is usually not a difficult task for those with the know how. But, if you're not quite sure about the process and have never put up a shed, it may be best to leave the job to the experts. The only thing you will need to do is choose the right shed for your particular situation. We have sheds and portable buildings for just about every purpose. Whether you want to store lawn equipment, a small boat, or some sports gear, we have the right model for your needs and the space available on your property. When it comes to shed and storage buildings, its always a good idea to buy from the pros. At C & J Enterprises, we aim to pleas St. Augustine residents, with great service and reliable products. The products we offer are attractive and look like sturdy structures, not temporary sheds that are easily damaged. Many models can be coordinated with the home colors or the home's design. Don't buy a portable building or shed until you check out what we have to offer. The EZ portable buildings are some of the most popular in the industry and come with our guarantee of satisfaction.